In small bowl, mix powdered sugar and 1/4 cup whipping cream with whisk; set icing aside. In 2-quart saucepan, cook brown sugar, butter and cinnamon over medium heat, stirring often, until butter is melted and sugar is dissolved. Remove from heat; cover to keep warm. In medium bowl, stir Bisquick mix, milk and egg with fork or whisk until blended. Stir in raisins. Heat griddle or skillet over medium-high heat (375°F). Grease griddle with vegetable oil if necessary (or spray with cooking spray before heating). For each pancake, pour about 2 tablespoons batter onto hot griddle. Cook until edges are dry and bubbles form on top. Turn and cook other sides until golden brown. Serve pancakes stacked with warm cinnamon mixture between each pancake. 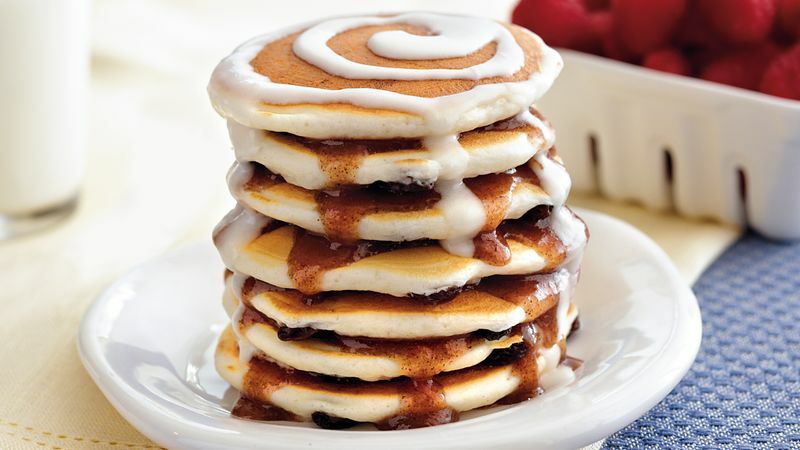 Drizzle with icing.